Merry Christmas, Blessed Solstice, and Happy Whatever-You-Celebrate! As we wind up 2018, I’m feeling excited about the fresh start and renewed optimism a new year implies. Wrapping up this year’s energy is naturally part of that mix. I’ve been getting pings lately to rush less and allow things to unfold at their natural pace. The rushing itself and interpreting my progress as insufficient is the issue, not the actual pace. In fact, what I’m hearing here is that things will actually progress more quickly and smoothly if I drop the angst factor. Of course, I’m sure I’m the only one who does that. HAHAHA! –Tarot reader joke. Another tidbit from the 2019 Look-Ahead Zodiac reading themes: let other people have their own processes, while you have yours. Don’t contort your behavior to fit into someone else’s ideal or to garner approval. It’s not sustainable. Likewise, don’t try to enact solutions for other people’s worries. Let them have their path, while you have yours. The biggest support you can give anyone is believing in their ability to navigate their own life. This helps shore them up a million times better than any “fixing” you can do. This all flows very nicely into what Tarot has to say here. We’ve got Judgement as the outlook, with the Nine of Wands coming in for advice from the Star Tarot. I followed up with a draw from the Botanical Inspirations deck, and we got a lovely Gerber Daisy. I always think of Judgement as a path to clarity. Ironically, I usually read this card as being decidedly “non-judgemental” in the sense of not assigning blame. It’s more of an observational thing, where what has been planted is bearing fruit and you can determine what works and what does not. This isn’t so much about right or wrong as it is informational. All information is good information, you know? The same theme is echoed in the advice we’re getting with the Nine of Wands. This version features the black and white wolves–what we would consider shadow and light. We couldn’t see light without shadow. It’s all part of the same whole. While there is an inevitable sense of being tired with this card, it also lets us know that standing your ground is indeed possible and that the situation(s) it refers to are close to being resolved. 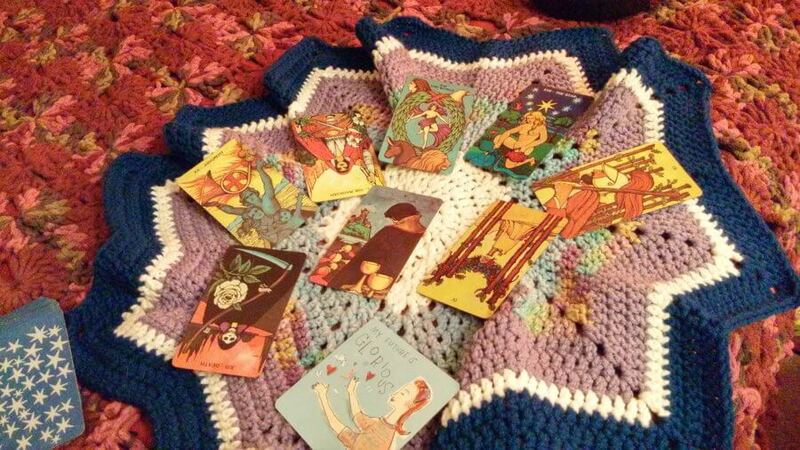 Tarot Nines are indicative of nearing the end of a cycle. So let that knowledge shore you up! Finally, we’ve got our lovely Daisies, standing for “purity, cheerfulness & innocence.” It’s a powerful attitude, and one I try to embody as much as I can manage. Don’t be quick to judge yourself (or anyone else) as “good” or “bad” this week. People are where they are, and that includes YOU! I’ve found I am most likely to look upon others as lacking when I’m feeling that way about myself and I can’t be the only one. Moreover, what looks “bad” at first glance can really lead to wonderful improvements in the big picture. Let other people do what they do and wish them as well as you can as they do it, regardless of whether or not you’d approve. Keep steadfast to what rings true to your heart of course. And always, expect things to work out. Good and bad are in the eye of the beholder, you know? Are you prepping for a fresh start? p.s. Last call for the 2019 Zodiac Year-Ahead readings! If you want an overview of what to expect next year in audio format (with a keep-able mp3) and pictures of your cards to guide your upcoming year, just shoot me $50 on Paypal and I’ll put you on the list. I’m doing pretty well with staying caught up, so there’s not a long wait. Dealing with strife is something we’ve made harder than it needs to be. And in doing so, we’ve also made it far more painful. Imagine having someone close to you, living out a substance abuse scenario in glorious full-color…ouch, right? Most who find ourselves there have a number of very understandable, very uncomfortable reactions. None feel very good. We worry–how many ways could this go south, and how many people will it take out with it? We visualize disaster–and the expectation, in seeing a train wreck in the making, is not without basis. We try to reign it in before impact. But there’s no way to do that for someone else. And a train wreck is a train wreck. Once momentum hits critical mass, it’s going where it’s going and nobody trying to grab on will make an impact. They’ll only get beat up trying. All the come-to-Jesus talking, all the bargaining and the watching and the trying to control what cannot be controlled, all the begging and wishing and raging won’t change for another person. Because that’s not your job or your right. Only for you. But what if…what if you opted out of the drama? What if your intention, your perspective from a step back, made it possible for you to honor the good in a situation without immersing yourself in the pain? I want to harmonize with what I believe to be good. What would your life look like, if you tried to live that intention? What kind of vibe do you think that would build for you? What if you didn’t try to figure it out for anybody else, or you didn’t try to compensate for what you perceive as weakness, and just focused on what you love and appreciate? They are both part of what we opt to see as reality. There’s no universal law that says focusing on the crap side brings rewards. When you focus on your love, on your belief in freedom, and the goodness you’d like to see for those you care about and the world at large…you become a mirror for that energy. You amplify it. You shine it and help others who’d like to reflect it, just by your example. Your influence grows and you feel good. You can actually make a difference and not get bloodied doing it. You get there by standing back from the “full reality” and reflecting the better reality. Everybody runs their own (metaphorical) trains. Best to step back when you see one barreling through, holding on to he best of intentions and faith, while you mind your own itinerary. The first thing that jumps out at me about this combination of cards here, is there is going to be a certain degree of a need for detachment. And distance. As the week wears on. Monday is Judgment. Which I find a little bit ironic, because Judgment, to me, one of the least judgy cards in the deck. However, the idea that you take a step back from blame or not blame, being happy with something or not being happy with something, and just kind of evaluate results. Evaluate, “Hey, this worked out for me. Hey, this could have worked out better.” It’s kind of what the Judgment energy is all about, so Monday, whatever you can do to kind of step back and look at things in that light, will be good for you overall. Tuesday, we’ve got the Magician reversed. So, things will be going on that are out of your control. Get over it. Sorry, that’s not very warm and fuzzy. But if it’s out of your control, it’s out of your control. Wednesday, we have the World! Upright. And to work with the energy of the World, you do your best to do your best. And don’t worry about what other people are doing. Take advantage of your abilities, your expertise, your knowledge. And use what you’ve got to the fullest extent you can. That’s how you work with the World. Thursday, we have the Star, which is kind of a nice interlude here.. The Star is about hope. Not promise, not sure thing. But optimism. And bright light, and what I want to tell you about this card in particular and Thursday is: give yourself permission to be optimistic. Give yourself permission to hope for the best and not dream of the worst. Give yourself permission to look on the bright side. Even if it seems like it’s itty bitty tiny small. Okay. It will kind of open the way for energy to flow for you on Thursday and make it a little bit easier. Friday I’ve got the Nine of Wands! This guy is pretty much always tired. So, you know, that is what it is. I will say that when I see the Nine of Wands, I do know that you can hold out. You can get through whatever you need to get through. In this case, the week! And, you’ll make it, just maybe you’re kind of sick of it. The feeling that I’m getting with this is, just, the feeling of kind of being burned out, and, and tired of hearing the same thing and maybe a little cranky. But you know, you do what you need to do. So…don’t stress anything. Yes, you will get where you need to be and you are towards the end of the cycle. By the time you hit a nine, so that’s something to feel good about. But it is what it is. Saturday, I’ve got the Five of Cups. And I don’t know what to tell you about that, other than there’s a possibility emotions are going to be twangy and people are gonna be feeling what’s not right, feeling what they don’t have, feeling a sense of loss. Obviously this is a forecast for the collective, so, it’s not super individual in that sense. But the collective is made up of a lot of individuals. So whatever you’re feeling in that regard, feel it! You know, let it come, let it go, be kind to yourself in between. It’s not that hard. Just, all of it passes. Everything passes. Life is a temporary condition! Life is a transitory condition. So, you’re feeling bad, that certainly is, too. Give yourself a chance to get over it. Okay? And Sunday, I have the Four of Wands reversed. And, I’m reading this today as, you have to make a little extra effort to make a place feel safe. Or comfortable for you. I think it’s worth it, but it’s not automatic. You have to make effort. Um, doesn’t necessarily have to be a big to-do. Although it could be, if you wanted it to be. But…take steps to, to, to create a comfortable environment for yourself. A corner of your home/dixiblog/domains/afoolsjourney.com/public_html, or you know, a night out with friends, with people that you really trust, or, or whatever. Safe space. Not in an overbearing kind of way where you tell other people what they can and can’t do, but make a safe space for you.Okay? And what I want to say about that is…there’s a tendency right now to want to push, push, push, push, push or to try to hurry things along. And it’s not gonna work. So, why bother? Understand that what you think is the end of something may not be, or what you think something that should be ended, maybe there’s a purpose you don’t necessarily see. You don’t know all there is to know about it, but just take things as they come, okay? Take things as they come. It’s, it ain’t over until that fat lady sings. And, you don’t need to sing. Now, that particular sentiment might be a little much for where you’re feeling or how you’re feeling. But the idea of focusing on that, you know: you live in love, you have control over that. Not whether or not you have a lover in your life, but whether or not you live in a loving state, yes, you do! You have complete control over that. So, joy and light and love are things you have control over. And if you look to consciously shift your focus, your mood, your vibration to a place of joy and love and life, your future will not only feel more glorious, it will become more glorious. It’s okay to feel however you feel, you know, but do what you can to raise that, raise that, raise that a little bit at a time. Are you feeling it? Take a step back and give yourself permission to drive your own train. This week’s forecast features the Morgan-Greer Tarot and Louise Hay’s Power Thought Cards. What your own consult? Go here. When I first started dating my husband, we had some near fights over things I said. Or to be more accurate, we had some near fights over what he HEARD. There were patterns in communication with his ex-wife that impacted his paradigm. There were times he heard attacks that I never launched–they were echoes of old fights with a very, very different person. Now because he’s a very rational Virgo moon, clarifying my thoughts by providing a few supporting details completely eliminated the conflict. But had he not been able to adjust his hearing, we might not have made it so far, you know? The energy this week is kind of like that. The first thing that speaks to me about this spread in the number of reversed cards. The slow, trudging feel of reversed cards does not for a smooth week make. The other thing that bothered me more is the overview card in the position of “Future,” the Ten of Swords. Not exactly my favorite card to see, no doubt. But with only one Major in the bunch, I’m thinking at least frustrations and skinned egos should be of the everyday variety and relatively short lived. So I’ll take my comfort where I can find it! Monday, What to Avoid – King of Pentacles: Don’t be sugar daddy (or sugar momma) and don’t try to feed everybody else if your cupboards are almost bare, for yourself. Your first job is to take care of YOU and yours. I love me some generosity, but it comes after taking care of personal responsibilities, not before. You know how they say on airplanes, in the event of an emergency, you are supposed to put on your own oxygen mask, before attempting to help anybody else? That. Tuesday, Cons – High Priestess reversed: Mixed signals and incorrect assumptions could be a “thing” today. Don’t assume you know where other people are coming from if it’s not been made explicit. Potential for inopportunity blurting, 70%. Best if it’s not you as blurter, huh? I’d rather be the blurtee any day! Wednesday, Outcome – Page of Swords reversed: Sharp, critical words lead to hurt feelings. Overly edited, unclear communication can lead to misunderstandings, though. It’s a fine line to walk! Deliver messages straight up and neat–don’t dilute them, but don’t editorialize an extra punch with passive-aggressive chastising buried in the mix, either. Say what’s true and necessary, but with as much kindness as you can. Or at least without a smack, okay? Thursday, Conscious Desires – Ace of Pentacles: There is desire to get going in real-world, something-to-show for your efforts ways. Financial issues are one potential. Seeing actual, physical progress on your projects are another potential avenue. We want something to SHOW for our efforts and we’re quite aware of it today. Friday, Attitudes and Thoughts – Hanged Man reversed: A little trouble letting things go today? A bit shaky on the faith? Look for something fun to do and aim for some out-and-out escapism to counter. Obsessiveness isn’t a fun hobby. Saturday, Pros – Nine of Wands reversed: You don’t HAVE to dig your heels in to the bitter end unless you decide to do so. Why not reassess what’s really important here? Only dig in if it’s worth it. Knowing not everything is worth it is a true gift. Use it! Sunday, Immediate Future, Six of Wands: Payoff! Thank goodness. Be generous, bold, brave and true to your ideals and others will follow. I like this one! Overview/Advice, Future – Ten of Swords: Ouch, ouch, ouch! I’m not digging on the Ten of Swords as a weekly overview at all. But you get what you get. Don’t be surprised to run across some over-the-top crap during the course of the week, or people who manipulate situations for their own benefit. Yes, it can be hurtful but it’s always better to know. And if you find yourself getting ready to go nuclear, remember this forecast before you burn the lot of bridges. What’s your purpose? What do you hope to accomplish? Will an outburst serve that purpose or no? Act accordingly, because the implications seem…sticky here. They remain in the air a while. Affirmation: My life is unlimited in every respect. This thought initially seems at odds with some of the forecast this week to me. I would editorialize here though (as if I do anything but), and say that your life is primarily limited by your perspective. Are there hard times and big challenges that cross our paths? OH YEAH! But it’s not your struggles or pain or even gifts that define you. YOU define you, by what you make of all those struggles and pains and gifts. Can you see ways you’ve limited yourself by what you’ve made of something? This forecast features the mini Radiant Rider-Waite in a tin and the Deck of 1000 spreads, with some Abraham-Hicks affirmation cards. If you dig these forecasts, you’d probably like Dixie’s book. Want personalized guidance? Get yourself a session!